Inspired and informed by the work of the Rova Saxophone Quartet, Rova:Arts administers the ensemble's activities, presents work by other forward-looking artists, commissions new works by established and emerging composers, and furthers the public's understanding of adventurous art through education and outreach. In December of 2000, Chamber Music America honored Rova:Arts with a Commendation in the 2000 CMA/ASCAP Awards for Adventurous Programming. 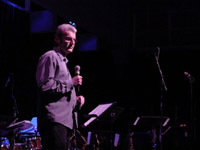 In addition to presentation, Rova:Arts' achievements include the commissioning of more than 30 new works for saxophone quartet from artists as aesthetically diverse as minimalist composers Terry Riley and Pauline Oliveros, avant-garde composers Fred Frith and Anthony Braxton, experimental rock musician Lindsay Cooper, and jazz luminaries Jack DeJohnette and John Carter. • San Francisco Grants for the Arts • The William and Flora Hewlett Foundation • The James Irvine Foundation • The National Endowment for the Arts • The Zellerbach Family Fund • The Wallace Alexander Gerbode Foundation • Meet the Composer • Mid Atlantic Arts Foundation.